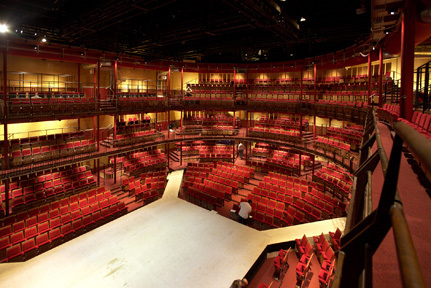 This temporary 1000 seat theatre designed by Ian Ritchie was completed in 2006 for the Royal Shakespeare Company in Stratford-Upon-Avon. Lawrence:King, in association with Charcoalblue theatre consultants, designed and co-ordinated a number of packages for the interior fit-out of the auditorium including the new tier fronts, balustrades and guardings, lighting bars and audience seating. Lawrence:King have also recently completed an office fit-out contract to integrate the various RSC administration departments.